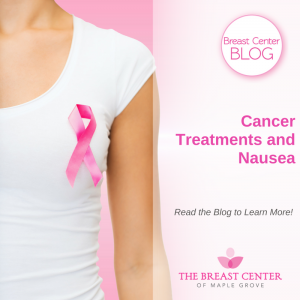 Nausea is a common symptom for those undergoing cancer treatment. Depending on the type of cancer, the individual, and the specific treatment, it can range from a slight uneasy feeling to severe vomiting and an inability to keep any food or liquids down. Nausea and vomiting is one of the most complained about side effects of cancer treatments. While it can feel hopeless at times, there are things you can do to better cope with nausea. Unfortunately, cancer itself can cause nauseous feelings, especially if cancer is affecting the brain. But more likely, the treatment is the culprit. The two most common treatments being used for cancer today are chemotherapy and radiation, both of which can cause nausea and vomiting. Chemotherapy is a treatment that uses drugs to destroy cancer cells in the body. Some chemotherapy drugs are more likely than others to cause nausea so it is helpful to talk to your doctor about symptoms you may experience before choosing which drug is right for you. Radiation treatment uses targeted energy to attack cancer cells in the body. The greatest risk for nausea associated with radiation is when the treatment specifically targets your brain, abdomen, or, in some cases, your entire body. How large of a dose are you receiving? In most cases, the larger the dose the more likely it is that you will experience nausea. How often are you receiving treatment? The more frequent, the less time your body has to recover which can lead to worse nausea. Have you experienced nausea frequently in the past? Some individuals are simply more prone to nausea than others. Peppermint—Sucking on peppermint candy or drinking peppermint tea helps your stomach muscles relax by decreasing stomach contractions that may be causing your nausea. Ginger—Candied ginger or ginger tea is also proven to help reduce nausea symptoms. Acupressure Bands—These are wrist bands with a pressure ball on the inside of your wrist. It stimulates the P6 (or Nei-Kuan) acupressure point, relieving feelings of nausea. Smaller, but more frequent meals—Instead of three larger meals a day, try five or six smaller meals to keep your stomach at a more consistent level. This will help make sure you get enough to eat and keep your blood sugar even too. Avoid certain foods—Stick to foods that are on the bland side and avoid fried, spicy, sweet or salty foods. Especially stay away from foods that have strong smells, as these can easily set off nausea when your stomach is sensitive. Sip slowly—If you are having trouble keeping things down, take continuous small sips of clear juice to keep hydrated. Other liquids, like broth, weak tea, or gelatin, can also help the feeling of nausea. If you are experiencing nausea and/or vomiting, and home remedies aren’t helping, you may want to try an over-the-counter anti-nausea medicine, like Dramamine. If these over-the-counter medications prove unhelpful, talk to your doctor about receiving a stronger prescription. If your symptoms are on the milder side, your physician may prescribe a drug you can take as needed, or as you experience discomfort. If your symptoms are more severe, your doctor may ask you to take medication 24/7, whether you are experiencing nausea or not as a preventative measure. Discuss the severity of your symptoms and your individual needs to come up with a plan together. You should talk to your doctor about any symptoms you are experiencing, but if you find yourself unable to keep fluids down, take your medications, or have been vomiting for longer than 24 hours, contact a health care provider immediately. If you are in need of cancer screening or diagnostic imaging, come in to The Breast Center of Maple Grove. Our goal is to make it as easy and comfortable as possible for each patient to get the tests they need. Call us at 763-398-6370 to schedule today. « Can Breastfeeding Reduce your Risk? What Exactly is a Breast Cancer Screening? Can Breastfeeding Reduce your Risk?